Breakfast time! Plain Greek yogurt by Fage (I'm currently obsessed with this, pronounced Fa-yeh) It's so thick and creamy and has about 12 grams of protein per serving (half a cup). For those of you that are skeptical of Greek yogurt and of the price of it, I seriously recommend trying it. I consider a serving of Greek yogurt a small meal, and a serving of regular yogurt as a snack. 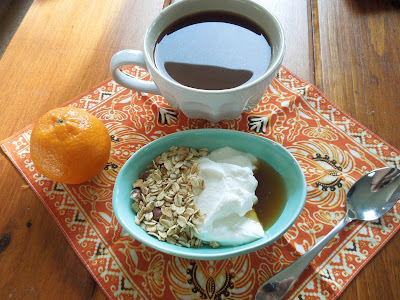 A little granola, honey and a clementine on the side :) Have a good day everyone!